"If you don't do it, you don't know what might happen." This is a great time to be working in clay. 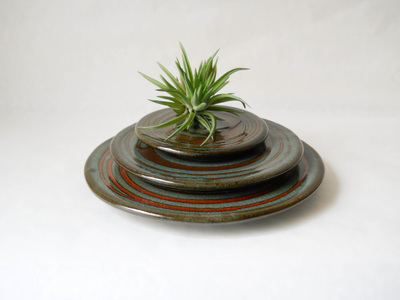 Art and craft, domestic ware, garden pieces -- so many possibilities and so much interest in the way that handmade items add warmth, color and intimacy to how we live. I appreciate several recent opportunities that came my way to explore concepts in clay and show my work in a variety of settings. Check out the images above. Like a story that tells the author what happens next, this body of work took on a life of it’s own that now feels complete and inevitable. Initially, I wanted to explore a circle within a circle and thought about using shards of glass melted in the heat of the glaze firing….then remembered the not-quite-predictable results of the whirling ‘spin art’ toy I played with as a child. It turned out that the process of creating the surface design with layered glazes was a bit scary and a bit exciting because – just like stepping onto a moving escalator – once begun, I had to continue and without any guarantee about the result (as in real life). 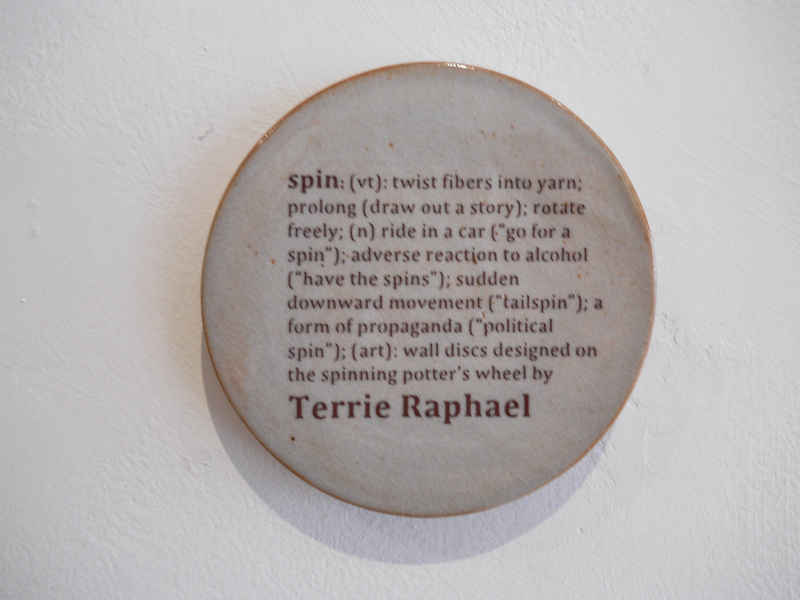 All this spinning of the potter’s wheel – first to form the pieces and then to create the dynamic surface – made me think about the various meanings of “spin” in our daily lives, both public and private. Whether concentric circles or spirals, actions or experiences, movement of the body or the planet, spinning involves the intentional and the surprising. 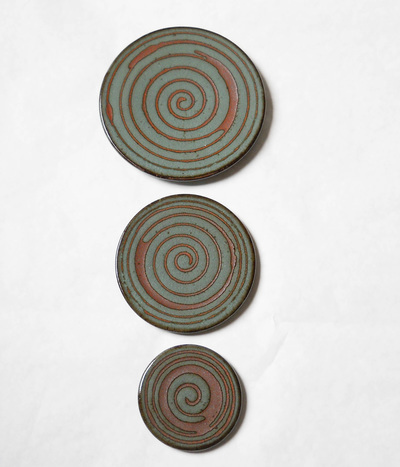 And so the series “The Art of the Spin” came to fruition, with IDs created by a random generator as a reflection of the surprises that are part of the design process and firing in a gas reduction kiln. The three disks in each composition can be hung vertically, horizontally or in any random pattern that pleases the viewer. 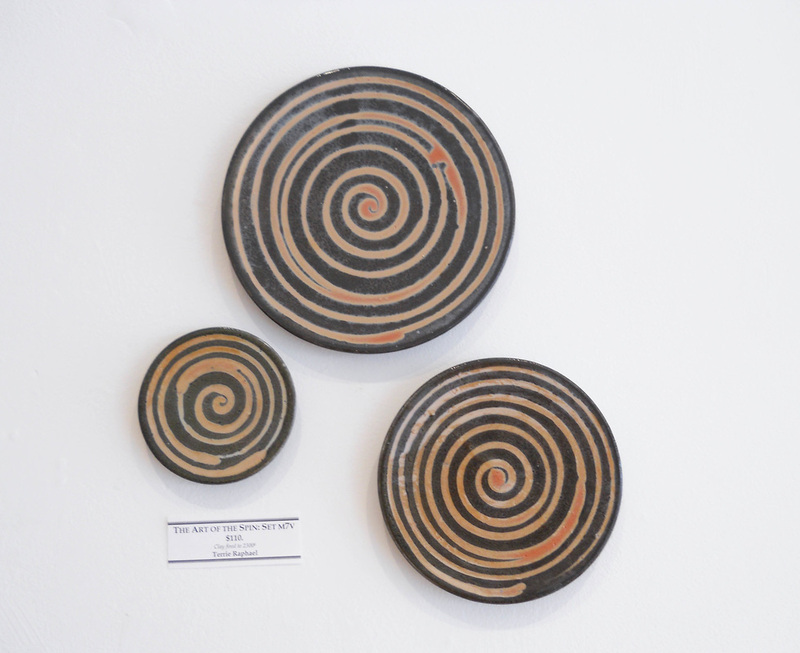 On the table, the disks can be used individually to serve food or as trivets to hold a hot dish. As well, they stack nicely as a decorative accent on a shelf or bookcase. 'Southern Migration' AMOCA Exhibit - One of my wall vases was selected for a juried show were on display in the Vault Gallery at the American Museum of Ceramic Art -- http://www.amoca.org -- in Pomona, California. Nancy Selvis, ceramic historian, was the juror. In her review of the pieces I submitted for consideration, Ms Selvis commented in part that I "achieve emotive content throughout the simplest of forms." Frances - At a restaurant named for her Grandmother, Chef Melissa Perello offers a menu with modern California sensibilities and a focus on ingredients from local markets, farms and producers in a casual neighborhood setting. I had the opportunity to collaborate with Chef Perello to create bowls in three sizes using a dark brown clay and creamy white glaze. The daily tantalizing menu is at http://www.frances-sf.com/menu.html. Whistle - In a sweet spot at 1311 16th Street just off Irving in San Francisco's Sunset neighborhood, Katie Gaertner has a petite shop filled with international housewares, gifts and accessories. She has a great eye for design and color with years of experience as a buyer and visual merchandiser. 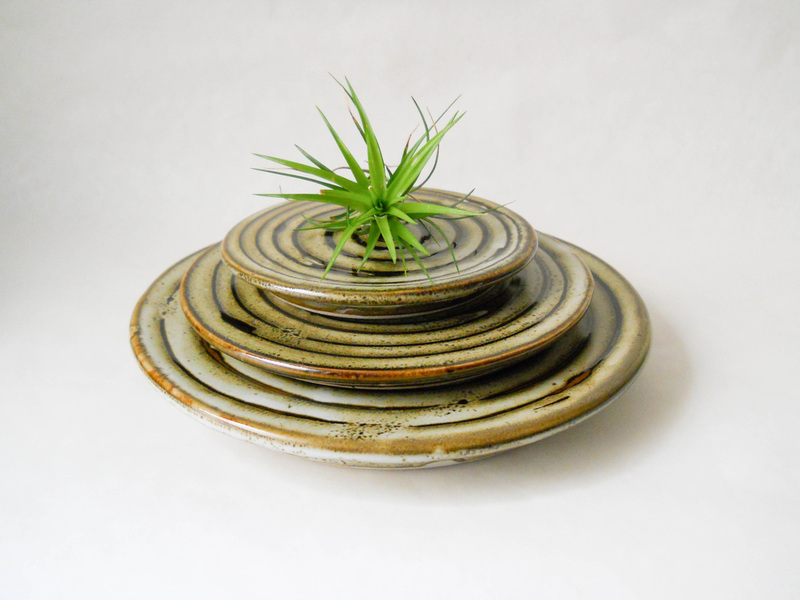 It is an honor to have had my locally made small oval condiment bowls now on sale at Whistle . Stop by any Friday, Saturday or Sunday to see what is special, and follow Whistle on Instagram at http://www.instagram.com/shopwhistlesf. For more information, check out http://www.whistlesf.com. Martha Stewart American Made - A series of my airy vases, designed for Tillandsia (air plants) was chosen by California Carnivores for their on-line offering through Martha Stewart's American Made program. The plant artists at California Carnivores designed ready-to-purchase arrangements at http://www.ebay.com/itm/California-Carnivores-Tillandsia-Air-Plant-Vase-/271430653632. And, information about the amazing carnivorous plants they nurture is available at http://www.californiacarnivores.com. STUDIO Gallery: "Tiny" is the annual juried show of works under 7" x 7" that runs from November 12 through December23. Curators Jennifer Farris and Rab Terry have been showcasing the work of Bay Area artists since 2003, and their new light-filled space at 1641 Pacific Avenue is a welcoming, colorful and inspiring place to see new work with a local flair. My "rhythm" designs were part of this year's show. For details, visit http://www.STUDIOGallerySF.com. Driftwood Salon: Tucked into a lovely low-rise building, Driftwood Salon is an oasis of art in the southeast corner of SOMA. 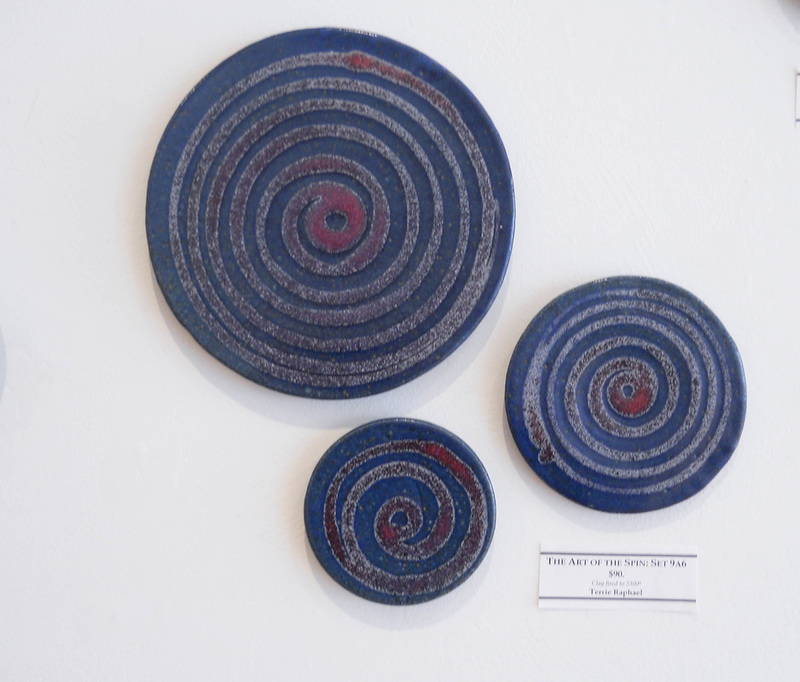 It is the studio and gallery of ceramic artists Camille Ochoa and Anthony Macias. In addition to year-round exhibits that challenge viewers to consider their place in our complex contemporary world, they have installed a ceramics boutique through December. The space is worth a visit -- drool-worthy for any artist -- and the current show features ceramic sculpture as well as mugs, vases and other giftable vessels. Driftwood is located at 39 Isis Street. For details about hours, visit http://www.driftwoodsalon.com. San Francisco Magazine - The theme of the May 2016 Special Issue of SF Mag was "The State of the Arts and the State of the Artists." 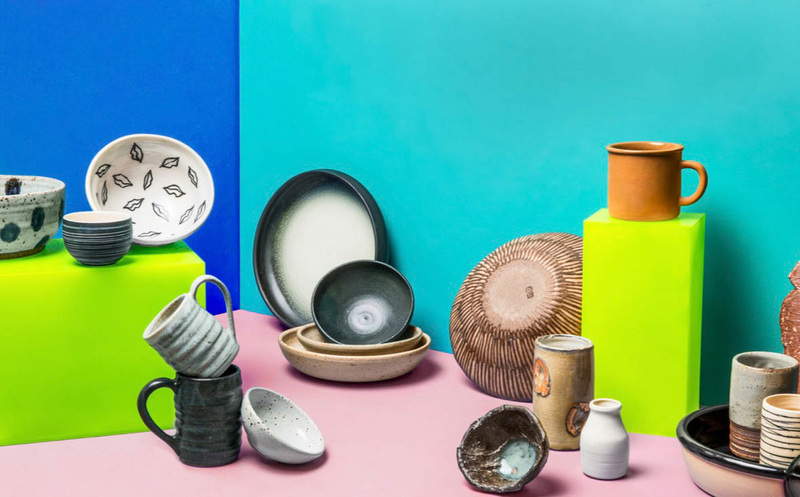 An article by Rebecca Flint Marx, one of the magazine's senior editors, focused on "...an almost insatiable appetite for local, handmade tableware" in the Bay Area. The photo for the article, by Aubrie Pick, included two mugs and two tumblers similar to those I have made for Bar Tartine. My mugs are the stacked dark blue and light blue 'ripple' style on the lower left. My tumblers are the tall 'pinched' tan tumbler on the lower right and the smaller tumbler on the far right with an unglazed portion near the base for an easy grip.